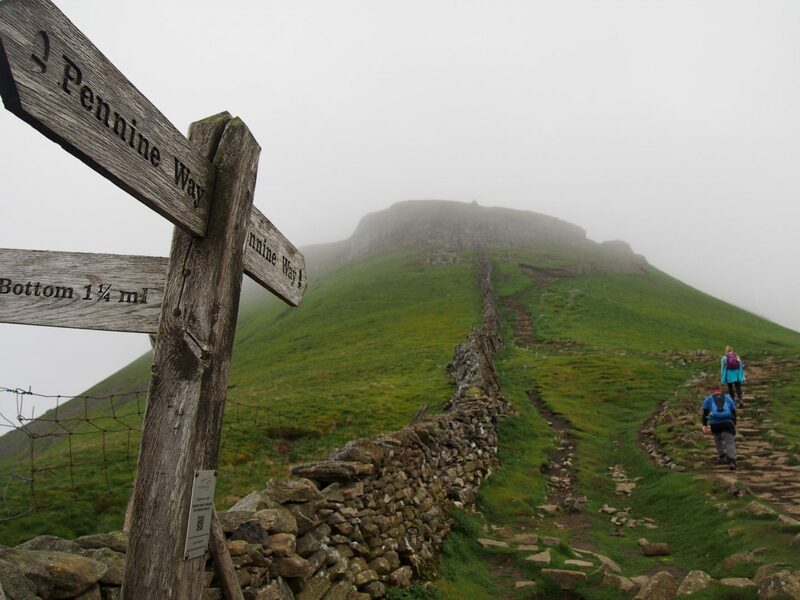 It’s one of the most popular challenges in the country, with thousands trooping to the Yorkshire Dales National Park, aiming to complete 25 miles in less than 12 hours around the park’s famous three peaks. 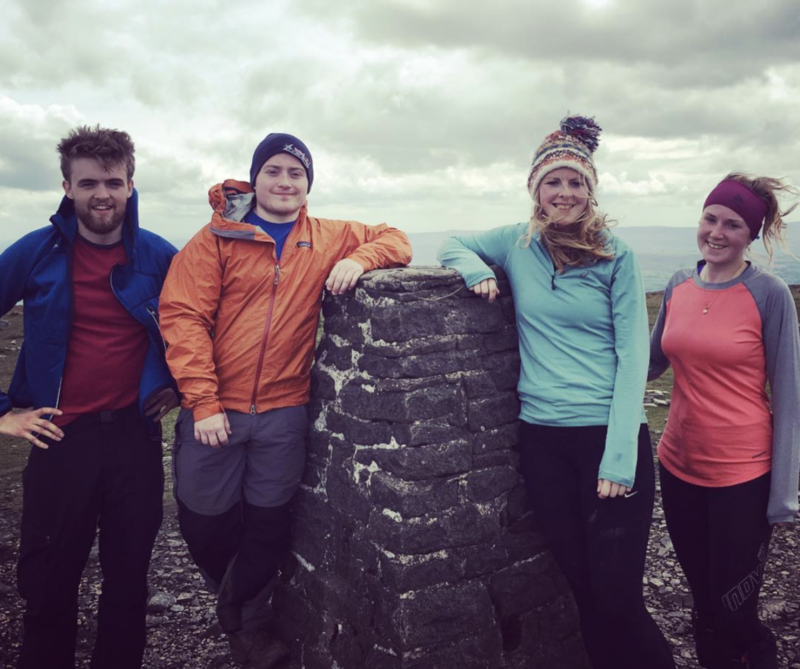 Last weekend saw us following suit and gearing up to take on the Yorkshire Three Peaks: Pen-y-Ghent, Whernside and Ingleborough. Beepbeep. Beepbeep. Beepbeeeeeeeeeep. The alarm screamed in my ear, and groaning I tried my best to silence it, only to find my phone buried deep in the covers. As it continued to screech into the silent morning, I scrambled to find it, and the cold morning was a slap to the face, truly waking me up. When I finally found it, the screen read 4:54AM. There was no sleepy feeling left and I grabbed for my clothes, which I’d thankfully had the foresight to get ready the night before. We needed to be walking by 6AM and there was no time to be spared. Walking out of the campsite (a little late) at 6:25AM we set off for the first peak of the day: Pen Y Ghent. A huge dark cloud hung over it, clinging on for all it was worth. Praying that it would have dispersed by the time we reached the top, we set out on a steady march. Pacing was going to be key on this walk, especially as only one of us had walked as far as 25 miles in one go before and two of us were injured. Beautiful wide grassy fields led the way to the start of the climb and up we went. 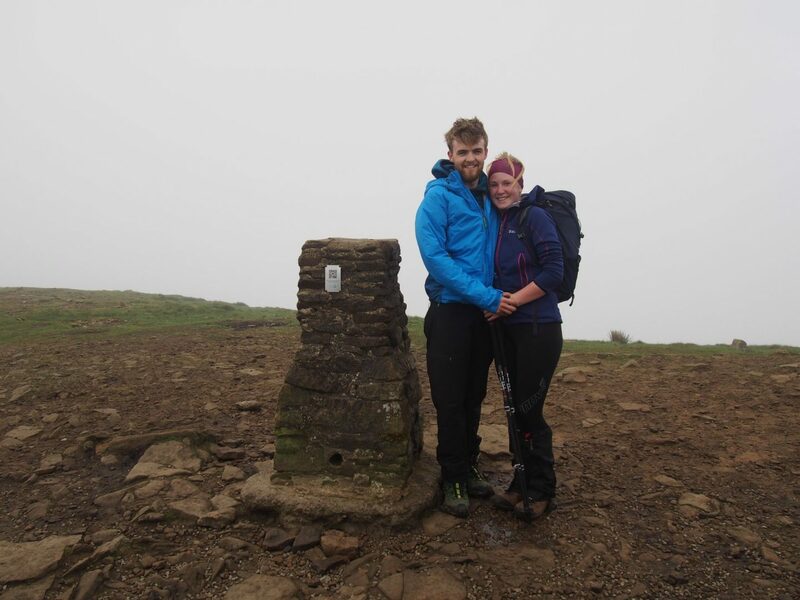 Having understood the Yorkshire Three Peaks to be a simple walk, I was surprised to encounter some sketchy ground as we neared the top of Pen Y Ghent. Loose and slippery stone had us treading carefully but as we reached the top, the loose ground gave way to stone flags. Reaching the summit trig point in an hour and five minutes we were pretty spot on with our pace. With feet and legs still feeling fresh we marched onwards, on a solid gravel path. It was going to be hard on our feet if the whole route was going to be like this. I half expected it to be. With thousands of people doing this walk every weekend there needs to be some kind of structure to it, or the erosion would be catastrophic. 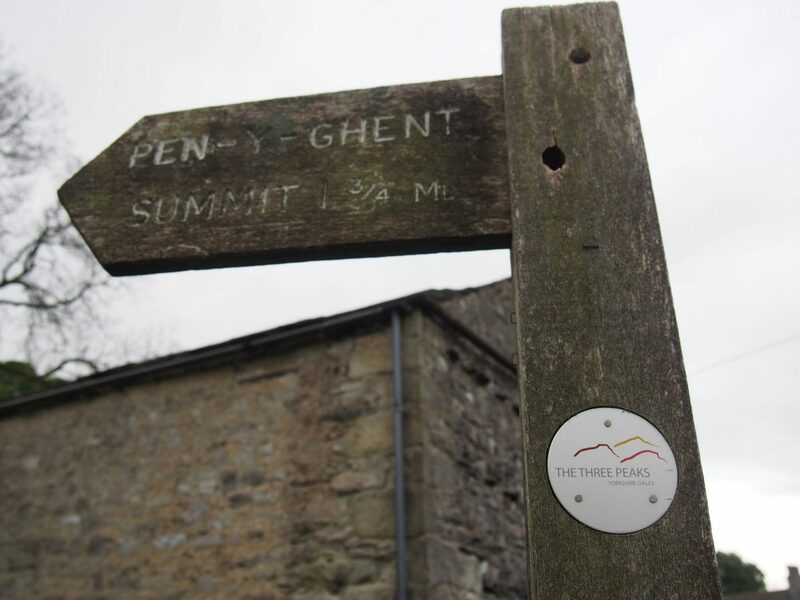 The walk between Pen Y Ghent and Whernside was a long haul – nearly ten miles of busy footpaths. We were overtaken by a few groups, who were obviously after the best possible time, and in hindsight, that focus and drive to get around makes up for the fact so many people surround you all the time, and that in places the landscape was less than exciting in the cloud. 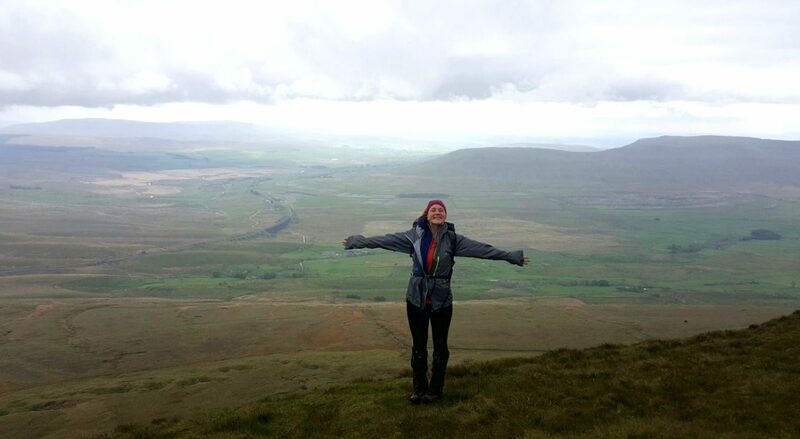 Joining the queue to climb Whernside, the rain kicked in properly. It was frustrating as it was amusing; it was obvious I wasn’t the only one who was sticky and hot under my coat but reluctant to remove the protective layer. The higher we climbed, the less the rain fell and we could enjoy the beautiful summit walk of the mountain. It’s long and narrow, with a beautiful ridge dropping off to the left. Normally my head would spin at the exposure but I didn’t at any point feel trapped. The track was beautiful and wide – a vehicle could drive by it was that wide, so instead of feeling nerves, I could enjoy the walk and how awesome the ground looked as it dropped away. The summit was busy and we soon moved onto the descent. Although not chasing a particular time, we wanted to be done within the 12 hours and so kept our feet moving. Dropping down the other side, I couldn’t help but notice just how badly eroded the path was. It was a true mudslide, and although there was a path, in the wet it was lethal. This meant many people went charging off path to escape slipping on the slimy stone, consequently damaging the surrounding hillside. In fact, as we finally reached the bottom and looked back, the muddy scar was firmly stamped into the hillside; it was a dark blemish surrounded by lush green and could be seen from a very long way away. 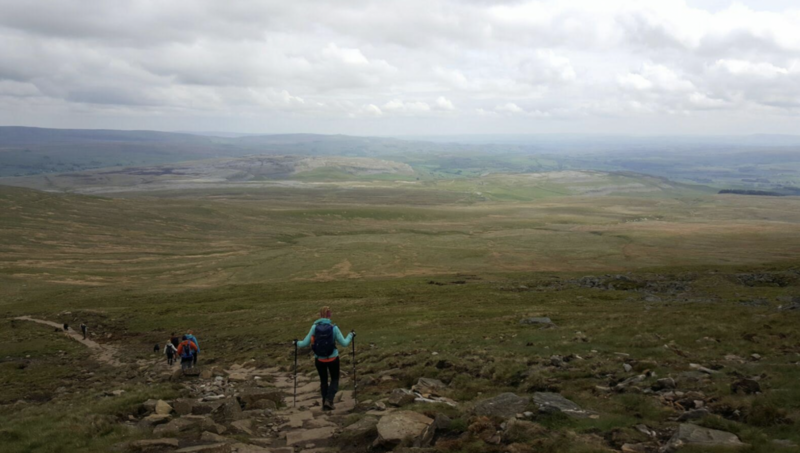 It wasn’t far to Ingleborough now and, once again, onwards we marched. This was a much more satisfying climb and we had a lot of fun trying to spot the path we’d be taking as we approached. It looked nearly invisible until we were right upon it. We’d seen, and followed, a stone flagged path into the bowl below the summit but could see nothing but near vertical slopes out of the bowl and onto the top of the mountain. Slowly a thin zigzag came into view, with small ants winding their way up and I felt relief in my stomach that we were going up this path, and not down it. I’m not sure I could’ve taken another landslide descent like the last. Is it weird to admit, it’s the climb that I love about a walk? Eager to get my legs working on that path I pushed on, soon getting caught up in the queue. This would be a lovely part of the walk, if not for the constant queuing. Kindly letting us past, we scrambled for the summit as fast as we could, and by the time I reached the top, the lungs were certainly blowing. After nearly two months out of exercise due to my knee, the climb was certainly testing me. Reaching the first gate, our elation of reaching the top faded fast. False summit. Turning right through the gate, we pushed on, and soon the path opened up onto a broad stony top. It’s worth noting that if you’re following this route, the signs lie. 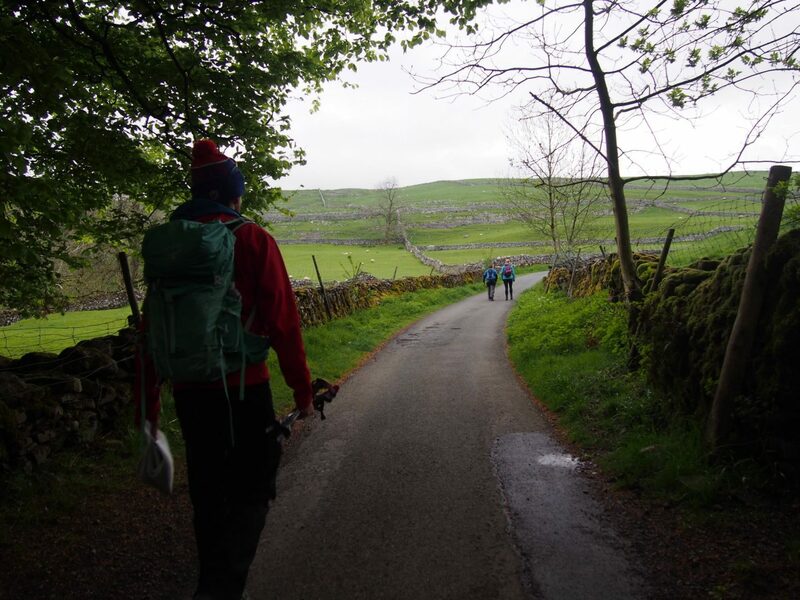 It is sure as hell more than two miles into Horton-in-Ribblesdale. So, take your time, don’t rush and enjoy the landscape. This is the bit you’ll cripple yourself on, if you go for it. It’s hard ground, uneven and interesting, and it’s a lot further than you think. Up to this point I was still feeling remarkably fine, and it was only as my feet hit the tarmac roads of the village that the harsh jarring started moving up my legs. It must have only be quarter of a mile at absolute maximum back to our start position, where we could stop the clock, but as we rolled in the tarmac underfoot had really taken its toll. Trying to save face and hide the fact that I wanted to crumble into a heap, I couldn’t help but feel astonished at just how much of an impact the road surface had had on me. It would be unbelievably cool of you to pick up bits and pieces that you pass on your path. 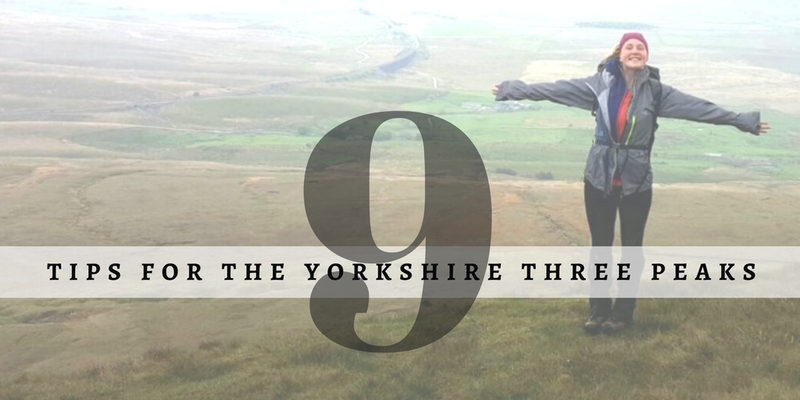 Click on the picture below to check out some of my top tips for this walk.